DCAC is a high-energy swim team and social club whose mission is to promote swimming for fitness, health and wellness and competition for the LGBT community and their allies in a team-oriented, coached setting. Whether you are looking to make friends, get in a great workout, or compete against top swimmers from throughout the region, the nation or the world, DCAC is the team for you. All ages and ability levels welcome. 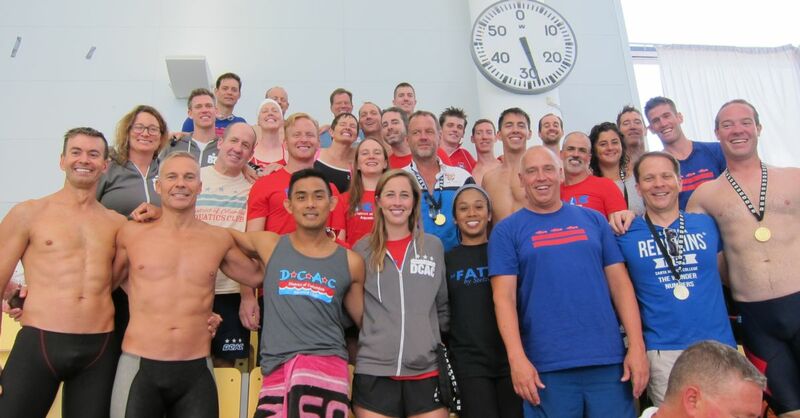 With close to 200 swimmers, DCAC ranks as one of the largest USMS teams in the Potomac Valley region, is one of the largest 50 teams in the U.S., and is one of the largest (primarily, but not exclusively) LGBT teams in the world. Our membership includes first time swimmers who have never competed in swim meets or swam on a team to experienced competitive swimmers, including Olympians, FINA Masters World Record holders, more than 60 individual and relay All-Americans, and over 200 USMS individual and relay Top Ten swimmers. DCAC is a member of both United States Masters Swimming (USMS) and International Gay and Lesbian Aquatics (IGLA). The team is comprised of a broad spectrum of people living in the greater Washington, DC metropolitan area. DCAC's membership is evolving to reflect the changing demographics of the community we live in, where people from different backgrounds and sexual orientations come together to share their love of swimming. Some of our social activities include: camaraderie in and around the pool, going out for meals after practice, attending team parties and socials, and participating in community outreach events (such as Pride) and team fundraisers. Come on out, and bring a friend, you'll likely meet many more! With a terrific set of coaches, DCAC's practices promise to challenge your physical prowess. The team trains for 1.5 hours, six times per week (see practice schedule). You can swim as many or as few practices as you would like and swim in a lane that best matches your speed and ability. Each practice will focus on improving stroke technique and building strength, endurance, and aerobic conditioning. Fitness and socializing aside, DCAC takes competition seriously! We have coached practices six times per week to provide our swimmers with the ability to optimize their skill, strength, endurance, and speed. Generally, the team trains for about 4 to 5 "focus" swim meets each year. Some swimmers swim in more meets, and others less or not at all. The choice is yours. However, we do encourage all swimmers to swim in at least one meet, as they are fun, provide team-building experiences, travel opportunities, and help you realize the payoff for all the training you've done.